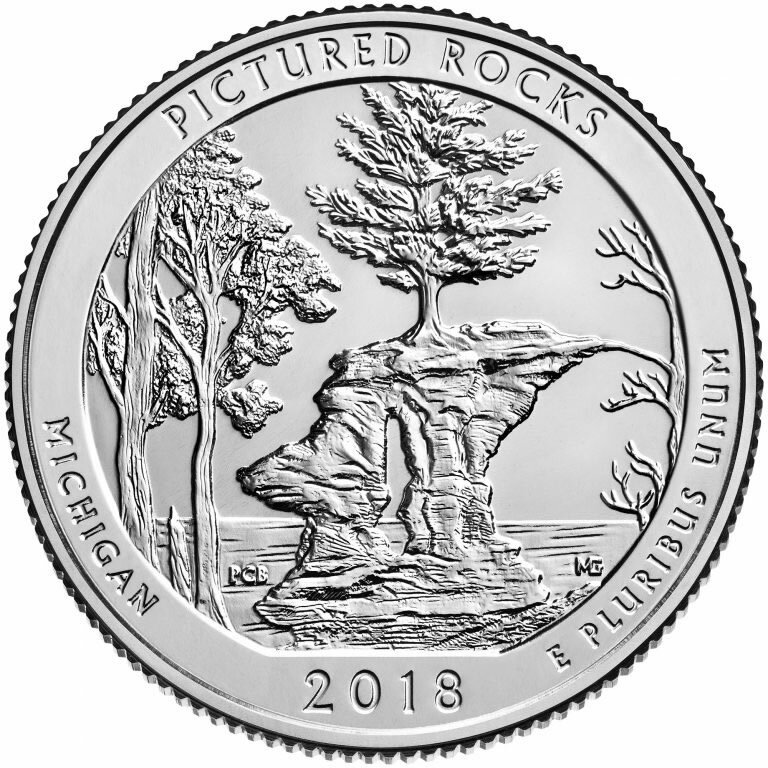 Pictured Rocks National Lakeshore of Michigan is the first national site commemorated on a U.S. quarter for 2018. The coin represents the forty-first release from the series of United States Mint America the Beautiful Quarters™, an eleven-year coin program that runs from 2010 to 2021.
its official launch ceremony hosted by officials from the U.S. Mint and the National Park Service at Mather Elementary School Auditorium (411 Elm Avenue, Munising, MI 49862) on February 7, 2018 at 10:00 a.m. EST. Right after ceremonial launches and in the same location are coin exchanges where attendees can swap cash for $10 rolls of new quarters. Coin forums are hosted by U.S. Mint officials who discuss current and upcoming products. Thirteen candidate designs for the quarter were developed by the U.S. Mint in consultation with representatives of the national site. The Treasury Secretary selected the winning design after the Commission of Fine Arts and the Citizens Coinage Advisory Committee reviewed them. Created by Paul C. Balan and sculpted by Michael Gaudioso, the design depicts Chapel Rock and the white pine tree that stand upon it. The rock formation is a main point of interest within the park. 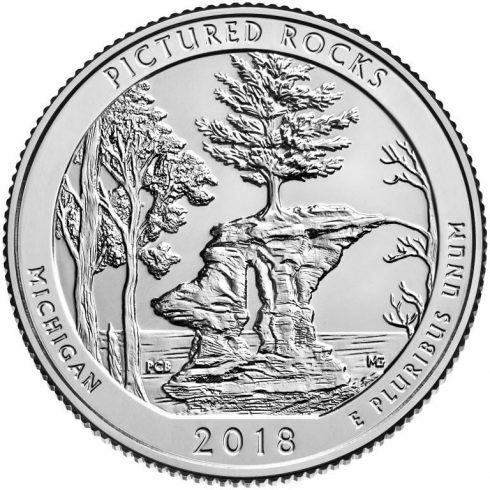 Around the design are inscriptions "PICTURED ROCKS," "MICHIGAN," "2018" and "E PLURIBUS UNUM." All quarter obverses (heads) share John Flanagan’s portrait of George Washington. Both obverse and reverse designs are also featured on a series of U.S. Mint bullion and collector 3-inch diameter, 5-ounce silver coins. Pictured Rocks National Lakeshore of Michigan was initially created on October 15, 1966 by an Act of Congress. It marked the first such designated site in the National Park Service system, but would not be the last. The national lakeshore runs along the shore of Lake Superior on the upper peninsula of Michigan for 42 miles. Fifteen of those miles consist of colorful sandstone cliffs which rise up to 200 feet above sea level and for which the lakeshore takes its name — Pictured Rocks. Almost half a million visitors come to the lakeshore annually. They can enter the park from either end on paved roads, but must use a county road if they wish to drive from one end to the other. Unfortunately, the road only comes close to the shoreline at two locations, making a hike or a cruise the only viable option to really take in the pictured rocks scenery.